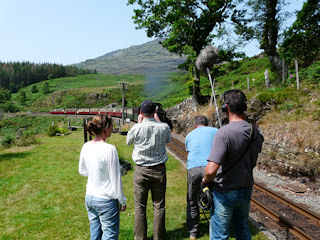 The crew have been filming for a week on the Welsh Highland and the Ffestiniog Railways. Earlier in the week the cameraman was filming from inside the loco and had to catch the fireman as he fainted; must have been hot. Programme is due to be broadcast in December. This is the 16th year of the programme and they film 6 journeys from around the world each year.